Refugees, asylum seekers, and immigrants in need download the Tarjimly mobile app on iOS or Android and they sign up as a refugee. Aid workers can also use Tarjimly and sign up with their organization. Beneficiaries create a shortlist of languages they need a translator for and preferences on their home screen. When a beneficiary needs a translator or interpreter, they select that language, and Tarjimly searches to find and connect the best available volunteer. This can take from 30 seconds to 5 minutes depending on the language pair. Tarjimly connects the translator and beneficiary in a live chat session where they can send text, voice notes, documents, or even get on a live phone call. When finished, either person can end and rate the session and ask to reconnect in the “Conversations” tab of the mobile app. 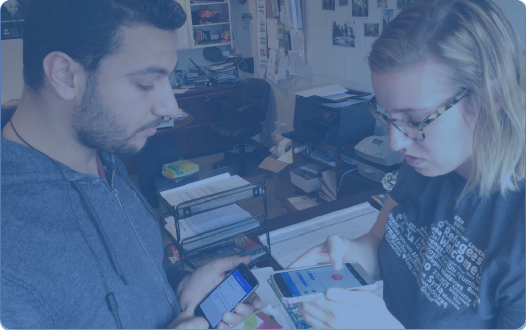 Volunteers that are multilingual download the Tarjimly mobile app on iOS or Android and they sign up as a translator filling out their proficiency and availability. Translators go through a privacy agreement, training video series, and code of conduct. All of these improve a translator’s “Tarjimly Trust Score” which is used to enable Tarjimly Certified Translators. When a beneficiary makes a request that a translator is suitable, that translator receives a notification on their phone asking if they are available. Tarjimly is no-commitment volunteering, so translators simply say no if they are unavailable. If they are the first person to accept a request, they are matched in a live session with the beneficiary and can send text, pictures, or even get on a live phone call. Translators can end the session, provide feedback, and also work on asynchronous translation tasks throughout the week in the mobile app. Translators can also donate to support and sponsor translation sessions to help even more refugees in need. Stay informed on our latest stories, updates and ways to get involved.